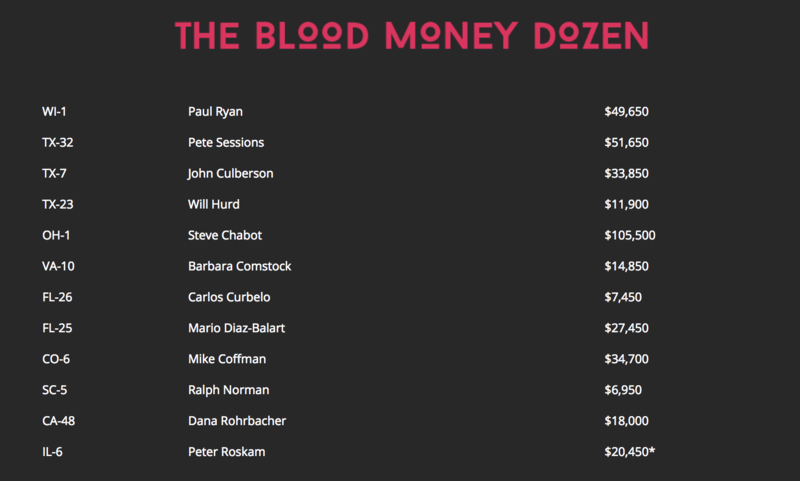 Defeat Paul Ryan's "Blood Money Dozen"
We will no longer sit idly by while Paul Ryan and his NRA Blood Money accomplices bury real gun reform time and again. From Sandy Hook to Charleston to Aurora to Pulse to Parkland, and every other shooting in between, the path of these politicians’ complicity is strewn with the bodies of our nation’s children and other innocent victims who have been slaughtered by gun violence. Enough. It is long past time to call out the Members of Congress who accept blood money from the NRA and clearly announce that we’re coming for them. We have selected twelve (12) of Paul Ryan's most loyal foot soldiers who prefer to put the NRA before their constituents. These members help Paul Ryan keep the Speaker's Gavel and prop the NRA's agenda in Congress. Donate $2, $4, $12 or $24 to help us flip congress, take away Ryan's gavel and finally hold Trump and the NRA accountable for what they have done.